The other day I was giving Elisabeth yogurt and decided to let her have a go at it with a spoon. She tried to use the spoon a couple of times but like her big brother, found that fingers just seem to work better. Last week I took Elisabeth in for her regularly scheduled check up and took Jonah with me. He does really well at first, reading the books and sitting on the chairs provided. But by the end of the appointment, he inevitably has his shoes off and is crawling around on the floor. In the subsequent days that follow he had 2 or 3 bad diarrhea diapers, but I didn't think much of it as he periodically just does this. Well, on the third day after Elisabeth's appointment, I started having a lot nausea, followed by stomach cramps and diarrhea all of which lasted well through Monday. Monday comes and Kelly starts having nausea; he's just now feeling normal again 5 days later. It was about mid-week when he had an epiphany of where this illness may have originated. It sure makes you not want to take your kids to the doctor for "well" visits, knowing it can easily result in the opposite. Change is Good - so the saying goes. What do you think? I changed the format again. The color gradient made the font colors challenging in the last format. So I picked a normal blogger template and then looked up how to change it from a two column to a 3 column blog. Since, I had to tweak the html code (no help from programmer hubby), it's unlikely I'll be changing it again anytime soon. Nevetheless, feel free to take the anonymous poll on the right to express yourself about the change. My mom did send me a few pictures of my little nephew, so I at least have a few. On Wednesday, June 3rd, we continued on to Okeechobee (another 2 hours south) to visit my family. My grandmother on my Mom's side, Mamaw Lewis, has always been dear to me and her health has been more fragile over the last year which has precipitated the need to enlist more help in her care and have her in closer proximity to the hospital. 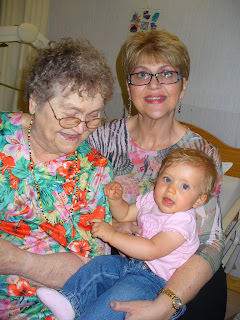 So this was the first trip where we visited with her at the nursing home. 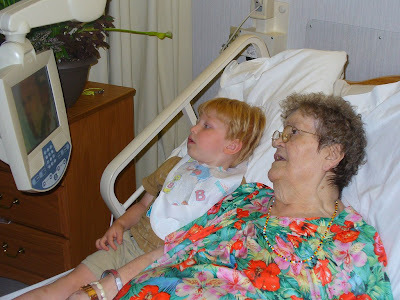 We saw her every day, and oddly enough, this environment was more conducive to a more quality interaction between the kids, especially Jonah, and Mamaw. Normally, at the house, Jonah would have been running around or hanging out in the "Man Cave" with Papaw (my dad) making it hard to get him to interact with Mamaw. 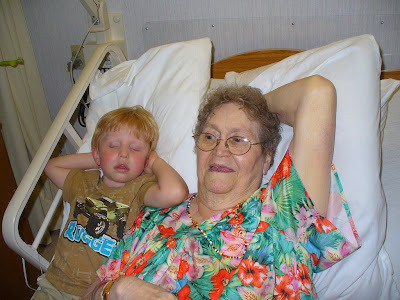 But in this case, Mamaw ended up with a bedmate for a few minutes. They have these cool TV's on protracting arms that you can pull right up to the head of your bed. So Jonah crawled up in the bed with Mamaw and they watched Animal Planet for a while together and talked about what they were watching. After a little while, Jonah fell asleep. I caught a picture of them with their arms in nearly the same position quite by accident. It was very sweet. 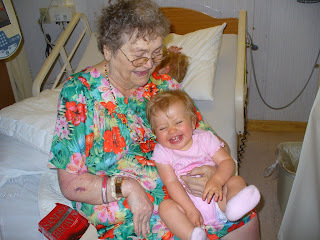 Mamaw also got to hold Elisabeth, who loved playing with the beads around her neck. While in Orlando, we decided to take a day and go to SeaWorld. 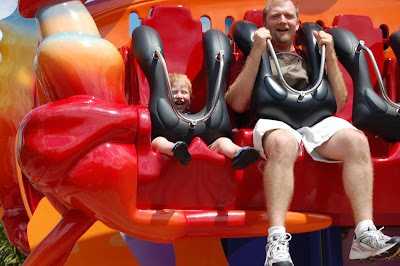 This was our first attempt at taking the kids to a major theme park. It went really well. We had to take a much slower pace than in the past and us big kids didn't get to ride the big roller coasters, but we had a very good time. We borrowed Ryan and Stacy's stroller which kept us from having to rent one (Thanks again guys!). Unfortunately they don't allow strollers in any of the shows or venues, so it makes for a lot of getting the baby in and out of the stroller - but at the same time there would be major stroller jams in the attractions if everyone brought in their strollers. Amazingly, there were a few rides that Jonah could ride and he loved it. There was one that was a miniature of Tower of Terror where it takes you up and then drops you a few times. We both thoroughly enjoyed that one :) Here are some of my favorite pictures from the day and then a slideshow of all the pictures we took that day. The second day in Orlando was spent visiting with Kelly's mom Darlyne and his Grandma Theresa. And ended hanging out with Kelly's Dad, brothers and sister-in-law. Here are some moments from that day. 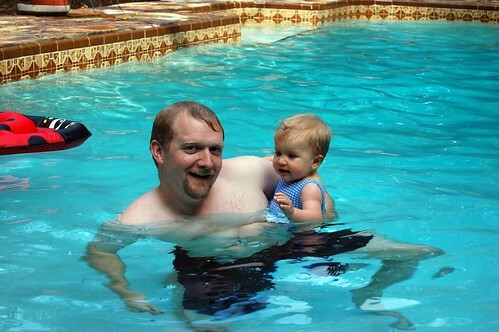 Also, when we got back Kelly's dad's, Jonah napped having fallen a sleep in the car and we took Elisabeth in the pool. Her first pool experience. She did really well especially considering that the water was a bit cool. The birth of my sister's baby precipitated a week long trip to Florida beginning on Memorial Day weekend. We stopped in Orlando first to see Kelly's family. On our first day there, Sunday the 24th, Kelly's dad had a cookout at his house. 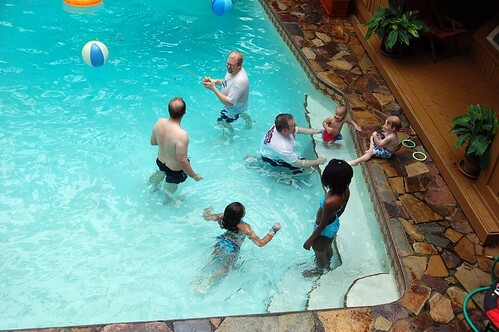 Here's a birds eye view of the Davis brother's and their kids hanging out in the pool.